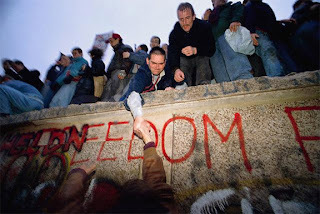 Today marks 20 years since the fall of the Berlin Wall. It happened so suddenly that Helmut Kohl, the German Chancellor, was out of the country and even George Bush Snr. admits that nobody in the west had even an inkling of what was coming despite the refugee crisis that proceeded it's collapse. Whilst the fall of the wall does not mark "The End Of History" as proclaimed by Francis Fukuyama, it does, for me, mark the end of a period of history. And I'm not talking about just the Cold War. It serves as a bookend to a era started by another singularly unexpected event... the assassination of Archduke Franz Ferdinand back in 1914. The outbreak of the First World War was the opening salvo in a European civil war which brought misery to our continent until finally the Berlin Wall fell and brought about the beginning of the end of a dark era in our history. And just as few people know much about European history in the years leading up to the First World War (the early years of the 20th Century are fascinating mainly for bearing very little resemblance to the world that was to follow... the First World War changed everything), the history of the Cold War ends (for many) at the point of the wall falling. Few remember the bloody events in Romania in December 1989 and fewer still know the story of the final collapse of the Soviet Union two years later. 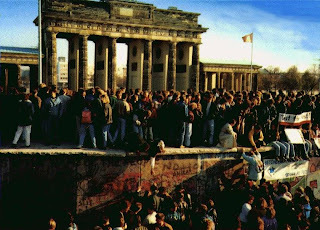 The fall of the Berlin Wall may have been just one event among many but it served as a mental shorthand for everything that followed (and a little of what proceeded it). 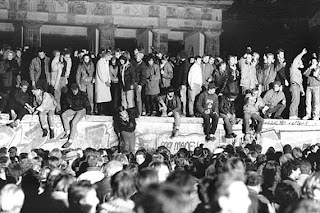 Despite this, it really was a momentous event in it's own right... brought about by a bureaucratic slip up at a press conference and seen through peacefully thanks to the determination of the East Berlin populace and the good sense of the East German guards who finally stood aside. If even one of them had decided to make a stand, however unlikely that might seem, we might look upon this date as something quite different. 20 years ago, our continent finally set about healing long held wounds and began the process of moving forward again into a new era... that is why we should be proud of the achievements of the people of Berlin that day. And very grateful too.